Posted By PA Breast Cancer Coalition on April 4th, 2016 at 9:41 am | 0 comments. Which is better at detecting breast cancer in women with dense breasts – an ultrasound or 3D mammogram? Dr. Wendie Berg, MD, PhD, FACR of the University of Pittsburgh School of Medicine and Magee-Womens Hospital of UPMC aims to answer that question with her PBCC-funded research. The PA Breast Cancer Coalition awarded a $50,000 grant to Dr. Berg this week to continue her studies of the two breast cancer screenings. Dr. Berg is specifically interested in screenings for women with dense breasts. Dense breast tissue can hide cancer on a regular 2D mammogram, and often, supplemental screenings are recommended. It is a personal subject for Dr. Berg; her mother was diagnosed when she was in high school and Dr. Berg found her own breast cancer diagnosis through additional testing. Dr. Berg and her team hope to deter mine if one of the options (ultrasound or 3D mammogram) are best in detecting breast cancer. On October 5, 2015, the PBCC awarded Dr. Berg an extraordinary opportunity grant of $50,000 to jump-start the process. 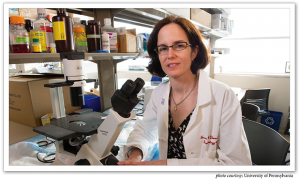 Her study was also chosen to receive a 2016 grant through the PBCC Breast Cancer Research Grants Initiative – a fund comprised of taxpayer donations and private funding from anonymous donors and foundations. 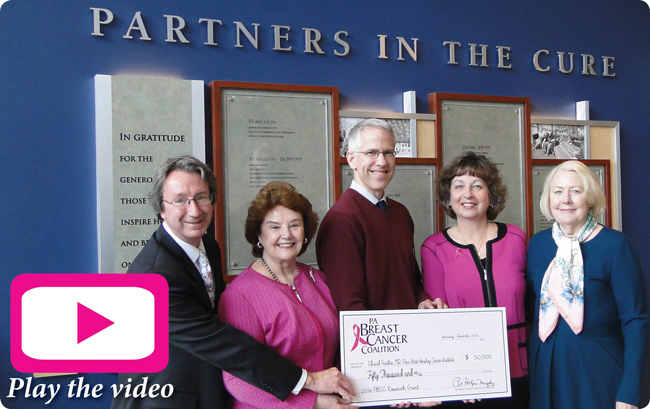 Watch the video below to learn more about Dr. Berg’s breast cancer screening research. Every Pennsylvania taxpayer has the option to donate their state income tax refund directly to our Research Initiative on Line 32. By choosing Code A, you join our fight to end breast cancer. Didn’t get a refund? Click here to donate now. Our goal in 2016 is to establish an endowment fund for research that enables us to continue our important mission of finding a cure for breast cancer now… so our daughters won’t have to. The PA Breast Cancer Coalition is incredibly proud to announce its total contributions to researchers at Penn State Hershey Cancer Institute have now reached $800,000! Our latest grant winner, Dr. Edward Gunther, will use his $50,000 prize in 2016 to study the growth of cells over time and to examine why certain cell subsets develop into breast cancer. Dr. Gunther hopes to find key information about breast cancer prevention and to eventually develop a test or screening tool with the information his team finds. A major portion of our Breast Cancer Research Grants Initiative comes from taxpayer donations. This is where YOU have the opportunity to bring us closer to a cure. Look for Line 32 on your PA-40 state income tax form and choose Code A to donate your refund directly to Pennsylvania breast cancer researchers. The average donation is $7 and the PBCC has used those donations to award more than $3 million in grants to innovative projects across the state. This tax season, donate your refund to life-saving breast cancer research! You’re Invited: PBCC Awards $50,000 Research Grant to Dr. Edward Gunther! Posted By PA Breast Cancer Coalition on February 15th, 2016 at 9:13 am | 0 comments. Want to be a part of our fight to end breast cancer? Join the PA Breast Cancer Coalition as we award a $50,000 breast cancer research grant to Dr. Edward Gunther on Thursday, February 25 at 9:30am at Penn State Hershey Medical Center. 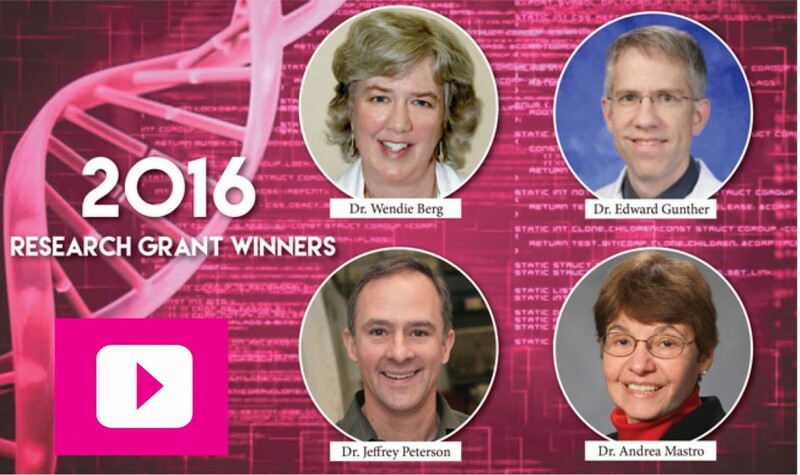 Dr. Gunther is one of four winners in our 2016 Breast Cancer Research Grants Initiative. He plans to focus on the cause of breast cancer by investigating cells that go on to cause breast cancer. Dr. Gunther and his team hope their studies will clarify whether this special subset of breast cells accumulates over time. If so, the cells could become an important target for breast cancer prevention. Working toward a cure is a goal YOU can help us achieve every year around this time. How? All Pennsylvania residents have a chance to provide hope for our future during tax season. Just choose code “A” on line 32 of the PA-40 state income tax form and every penny will go directly to innovative research going on right here in Pennsylvania. Thanks to those donations, we have awarded more than $3 million in grants to date! We hope to see you Thursday, February 25 in Hershey! Click here to RSVP.